TV reporters will be among the first to admit they aren’t rocket scientists. With their Journalism degrees and their slightly-above-average IQs, they succeed because they are just smart enough to look under rocks, grasp the obvious, write clean copy and produce ninety seconds of television. The good ones are quick studies, with a broad smattering of knowledge. They may know politics, the courts, or government. But most would admit they are rarely experts at much of anything except TV news. With that background, it may have made perfect sense for Adam Murphy to produce a story on WGCL about a system that purports to use water to enhance the gasoline mileage of automobiles. The piece ran several weeks ago. Murphy’s bio says he’s a journalism major from UGA. He’s not a scientist. Murphy’s story showed a couple of Mason jars connected with a rubber tube. There was a motor of some sort attached. And he interviewed a guy who claimed that it works. Turns out, it was the same guy who sold the contraption. Let’s not mince words: Mr. Murphy (a consumer reporter) was duped by a popular “water for hybrid” scam…. This particular variation of the scam claims that hydrogen, oxygen, and “charged molecules”, are added to the engine– all due to the miracle of “engine vacuum pressure”. (Other versions of the scam claim that steam added to the engine will increase pressure and improve engine horse power.) This of course is complete nonsense. Murphy has plenty of company. 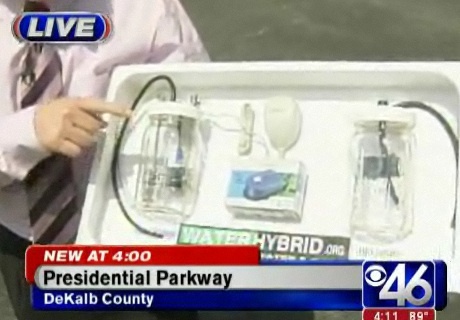 KRIV in Houston also did a story about a local guy producing fuel from water. Were they scammed? The CBS 46 offices are just a few blocks from Georgia Tech (a world-renowned engineering university). There, he would find Nobel winning researchers and distinguished professors, eager to describe what happens when you add water to an internal combustion engine. (The auto industry), which is writing down billions of dollars in inventory, has evidently overlooked a way to improve mileage by 50% in its SUV line. If we are to believe Mr. Murphy, he is sitting on the story of the century: a technology that would likely end all of our foreign oil imports, using just tap water. Meantime, Dagon notes, the companies that are producing these gizmos are showcasing these local TV stories on their websites and in their press releases, adding an air of legitimacy to the stuff that they’re selling. If Murphy got scammed, he wouldn’t be the first. In 27 years of TV news, there are a few stories I wish I could take back. One of them was a cute feature I produced on a dog kennel. A year later, WAGA’s I-team produced a piece showing the owner abusing animals. Go ahead, call me a dumbass. So I have some empathy for Murphy, a TV reporter trying to produce a deadline story on which he has no personal expertise. Perhaps this entire concept should have raised a red flag, the one that says “if it’s too good to be true, then it probably is.” Perhaps he should have efforted a comment from Tech (and maybe he did). Murphy concluded his piece by telling viewers that the vendor of this contraption would be available the following day, making sales at a hotel parking lot. Wonder how their gas mileage is now. This entry was posted in murphy adam, WGCL on July 30, 2008 by live apt fire. Thanks, Matt, for bringing the latest Jibjab piece to our attention. It has nothing to do with local news. If you don’t like it, LAF will refund your wasted time. A cleaner copy is here. This entry was posted in Uncategorized on July 29, 2008 by live apt fire. The Buffalo News reports today that WXIA has hired Ellen Crooke as its new news director. Crooke has been VP of news at WGRZ Buffalo. 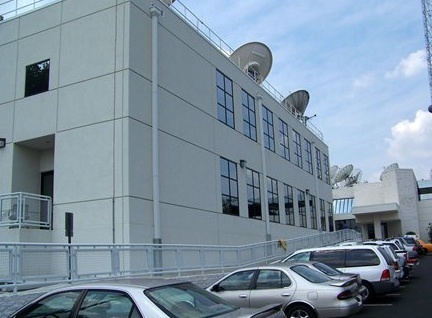 The News describes Crooke as “the architect of the revival” of WGRZ’s news. Crooke won’t show up at WXIA until September. WXIA reporter Julie Wolfe previously worked with Crooke at WGRZ. Crooke has been there six years. Both stations are owned by Gannett. This entry was posted in WXIA on July 29, 2008 by live apt fire. As traumatic as it’s been for the AJC in the last 18 months— including a sizable, ongoing round of staff reductions and layoffs— it seems there’s more to come. The AJC has been targeting February 2009 as the launch of what it calls AJC 2.0. The date coincides with the use of a new printing press. AJC 2.0 will include a major redesign of the “dead tree” version of the newspaper, as well as the AJC’s web site. It may also involve elimination or radical redesigns of some sections. The Sunday editorial section known as “@Issue” seems especially endangered, according to editor Julia Wallace as interviewed by Ken Edelstein of Creative Loafing. Wallace’s semi-incoherence shows how dangerous it is for news managers to try to make sense of audience research. In the interview, Wallace suggests that the AJC will fixate on its Sunday newspaper, with promotion of the weekday papers de-emphasized. She also claims that ajc.com is metro Atlanta’s most-visited website. The question will continue to be: How to make it a moneymaker. We’re already irritated with the AJC’s reorganization and belt-tightening. We’re irritated with its per-issue price increase for a product that’s in steady decline. In the interview with Edelstein, Wallace implies that the AJC may devote fewer resources to long-term investigative projects. That would be unwelcome. We’re also irritated to read that the AJC is sending Jennifer Brett, “the social butterfly,” to Beijing to cover Atlanta residents (including, we suspect, a few of the publisher’s rich friends) attending the Olympics. “I am purely going for the partying, not the sports!” sputters a lawyer quoted in Brett’s column this morning. This, from a newspaper that couldn’t trouble itself to cover the presidential primaries outside of Georgia. We’d like to see the February redesign be more than window dressing. We’re not optimistic that will happen. This entry was posted in AJC, Creative Loafing on July 28, 2008 by live apt fire. Let’s say you’re in the US Army. Let’s say you’re back from a tour of duty in Iraq. Maybe it’s your second or third. You settle in for a little TV news. You switch on WXIA at 11pm Thursday. She attributes the characterization to the soldier’s crying mother. The emotion is real. The mother’s house is festooned with paint and ribbon honoring the injured soldier, who’s home as she rehabilitates her injury. But then the details sink in: The soldier joined the Army only a few weeks ago. She is in basic training, meaning she hasn’t seen combat or even active duty. The injury to her leg— a stress fracture— occurred in boot camp. When she’s done with her rehab, she returns to boot camp to finish basic training, at which point her eight year commitment to the Army begins. “Hero” is a word that the media loves to overuse. Wolfe’s story is a classic example. The word is almost always attributable to somebody else– though frequently, it’s done at the prompting of the reporter: Do you consider (blank) a hero? Yes, says the tearful respondent. Wolfe made it clear that the young woman joined the Army to help support her mother. The mom considers her a family hero, not a war hero. Meantime, you’re an Iraq veteran who finished boot camp years earlier. You wear a combat patch on your uniform. Maybe you’ve lost some buddies or had some close calls yourself. You watch WXIA’s 11pm news Thursday. You see this teenager, still in boot camp, called a “hero” on TV. Twice. This entry was posted in wolfe julie, WXIA on July 25, 2008 by live apt fire.